You are currently browsing articles tagged Sandy Island. 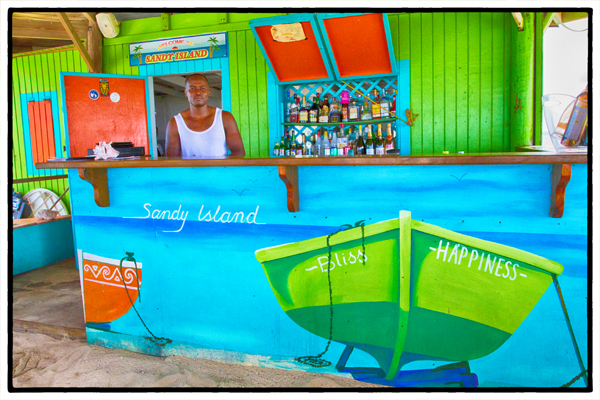 That’s Dion behind the bar on Sandy Island. Notice the mural with the boat with Bliss and Happiness painted on it. Bliss is the name of the other boat to Sandy Island. Photo by David Lansing. The man in charge of Happiness, as it turns out, was named Darrel. Darrel spent about 10 minutes giving us a safety check aboard Happiness, which was about twice as long as the trip over to Sandy Island itself. About Sandy Island: It’s actually an atoll, meaning it is made up of coral from the surrounding reef, and is shapped like an arrowhead. It is approximately 150 yards long and 25 yards across at its widest point. To walk around Sandy Island takes about 10 minutes. In short, there’s not much to it. Still, it’s an extremely popular day trip. 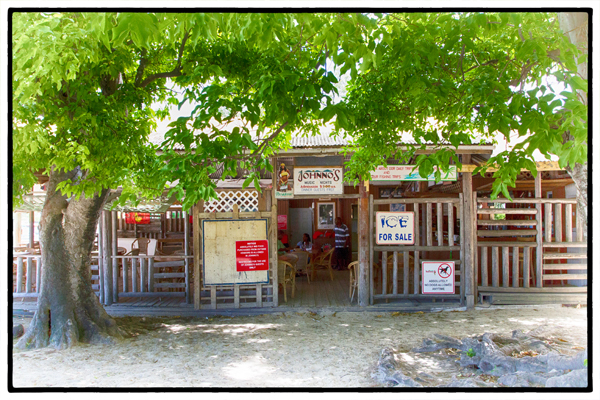 People go there because they have a little bbq shack that serves up excellent ribs, lobster, and fresh fish. They also go there to drink the rum cocktails with names like High Tide and JoJo’s Rum Punch. JoJo is the bbq man on Sandy Island. You cannot rush JoJo. He is a master and like most masters he takes his time. Which is why almost as soon as we arrived, Dion, who makes the JoJo’s Rum Punch cocktails behind the bar, warned us that we should order lunch just as soon as we knew what we wanted. Now I know that it was only a couple of days ago that I was making fun of people who don’t like to order the same thing their dining companion gets but it just so happens I’m also one of those people. Besides, I still had dinner to look forward to; I could get lobster at dinner. So I ordered JoJo’s ribs. Which I could smell cooking on the bbq. I was tempted to get JoJo’s Rum Punch but since I knew we’d be on this little spit of an island for several hours, I decided to go slow and start with a glass of French rose. Afterall, it all felt very French—sitting on a beach in our bathing suits, speculating about the people showing up on tenders sent from their private yachts, drinking rose. There may not have been much to do on Sandy Island other than eat and drink and gossip, but I was finding that to be to my liking. That’s Berecia and JoJo, the barbecue master, with ribs for me and lobster for Luscious. Photo by David Lansing. 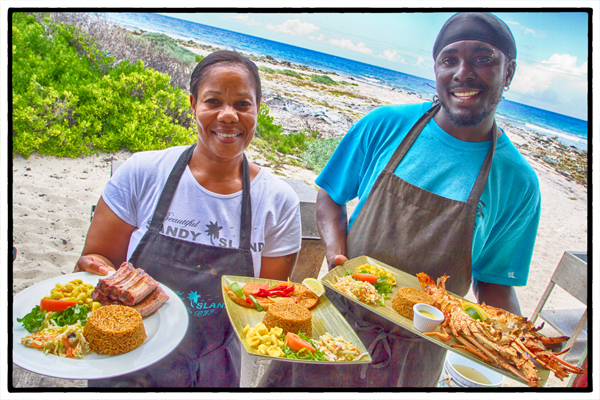 Johnno’s at Sandy Ground on Anguilla. Photo by David Lansing. Glennis drops us off at Johnno’s in Sandy Ground and tells us to wait there until Happiness comes to pick us up. “When will Happiness be here?” I ask him. While Luscious and I are waiting for Happiness, I wander in to Johnno’s. Glennis told me that Johnno’s makes their own hot sauce and it’s excellent. There’s not much going on in Johnno’s shortly before noon on a Thursday. There’s a man in a green shirt drinking a beer by himself and a young woman behind the bar washing glasses. “I hear your hot sauce is pretty good,” I say to her. She finds a spoon and slides it across the bar. I dip it in to the jar of hot sauce and put the tiniest amount on my tongue. I shrug, shove the spoon back over the bar, and go back outside where Luscious is sitting at a wooden picnic table on the sand waiting for Happiness. She asks me what I’ve been doing. “Eating hot sauce,” I tell her. Luscious nods towards the dock where a small boat is pulling up. “I think that’s us,” she says, standing up and grabbing her bag. 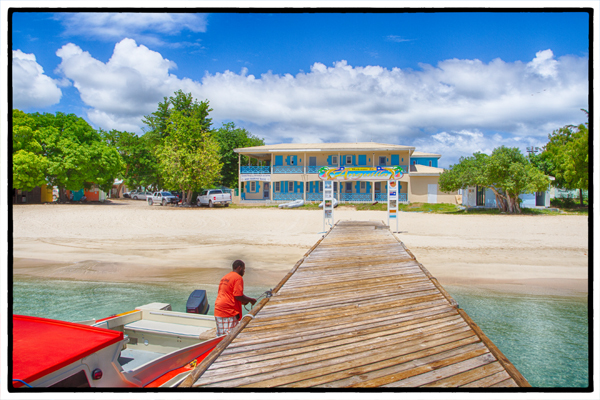 Happiness is just waiting to take us to Sandy Island. Photo by David Lansing.